Tech lover and T3 personality Stephen Fry has announced Stephen Fry's Big Digital Day, a London-based event that will bring together the nation's leading digital entrepreneurs and business leaders. Due to take place on Monday April 4th at London's Royal Festival Hall, Stephen Fry's Big Digital Day will see the QI host and author joined by his online business partner Andrew Sampson to host the day of high-profile key note speakers, workshops and seminars, all lead by influential industry leaders. Sharing the passion of all things digital, seminars will be held to assist those looking for media, legal, branding and design guidance with entrepreneurial attendees also to be invited to pitch their futuristic tech ideas to a business panel live at the show. Taking on the upcoming event Stephen Fry stated: "I think bringing people together to talk passionately and enthusiastically about all things digital for the sheer love of it will foster the kind of open, positive and imaginative thinking that characterises the best of the on line world." With the show set to run between 10am and 4pm, tickets are available for purchase now direct from the Big Digital Day website priced £250. 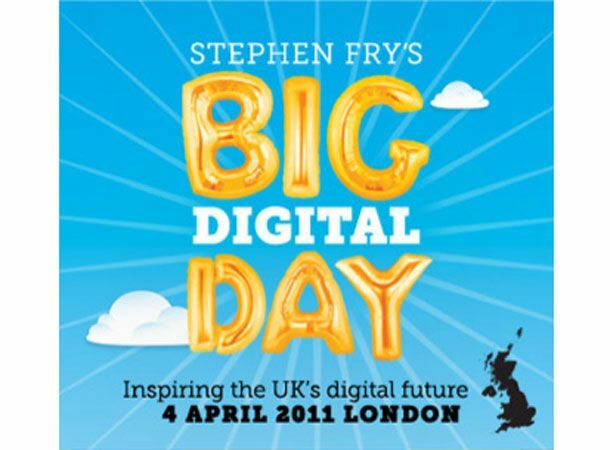 Will events like Stephen Fry's Big Digital Day help push the UK tech industry to new heights? Let us know your thoughts via the T3 Twitter and Facebook feeds.